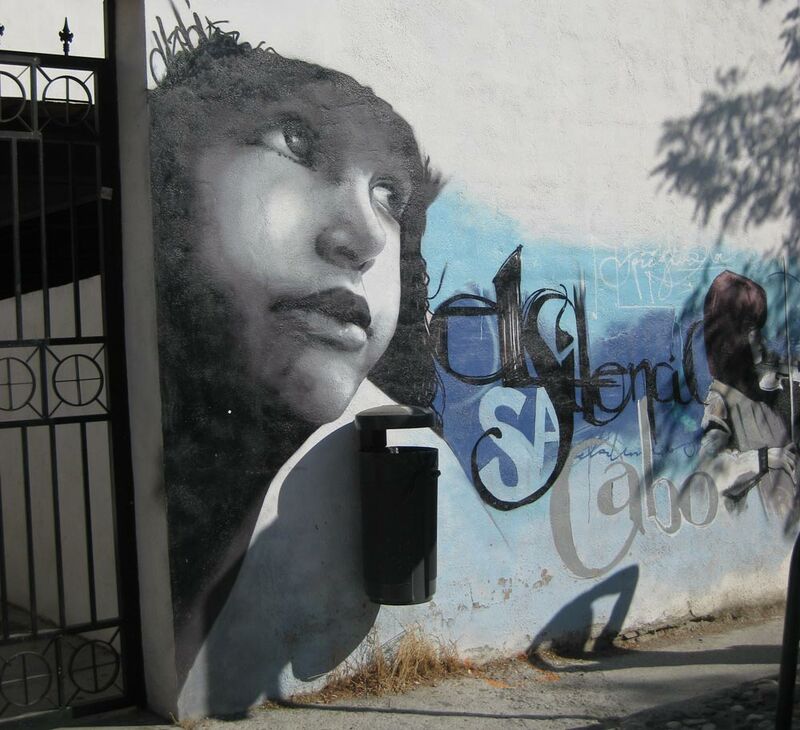 Raúl, El Niño de las Pinturas, has become an institution in the world of graffiti with his unmistakable graffiti forming part of the soul of Granada. However, the impossibility of continuing to paint in the streets as a result of new legislation has catapulted him into the centre of a bitter controversy. We caught up with El Niño de las Pinturas in La Candela bar, in his neighbourhood of Realejo. There are a lot of theories about the origin of graffiti. I think that graffiti is born out of a necessity that we have as people to express our true selves, to share, to communicate with others. As such, the birth of graffiti is directly linked to technological advance. Suddenly, the industrial revolution happens and we are provided with spray paints, which enable you to paint very fast. I believe it’s the fastest way of painting striking, large-scale pieces. Plus, it’s an easily accessible tool. Political pieces of graffiti appear. What was previously done with a paintbrush can now be done with spray paint, which is much faster. A tool which was in theory invented to paint shelves is taken and given an artistic use. It’s artistic because there’s a certain type of person using it who is being honest about what they’re doing, they’re doing what they feel they have to do. They are showing and sharing their singularity. That explains what graffiti does for the artist, but what does graffiti do for the city? Well it’s precisely that essence of singularity that is the key. I think that witnessing glimmers of the singularity of others makes us get in touch with our own singularity. We are used to being surrounded by publicity: things that are soulless, lacking foundation, created for a specific purpose and not entirely trustworthy. We are used to this sort of message and it therefore becomes more difficult for us to pause and look inwardly. In fact, what publicity tends to do is feed our ego. It projects onto us characters different to our own and makes us want to be things that we are not. In this way it separates us from the singularity that we possess. However, if we surround ourselves with things that are born of that singularity and made with love and a desire to share, we are in some way led in the search for singularity. It creates an environment in which we are more likely to seek our singularity. Many people think that there are other places where one can express oneself. I think there are many spaces in which one can express oneself. In fact, it is for this very reason that our society is supposedly a cool one; part of our money is dedicated to culture and public spaces so that we can have access to that expression that we are talking about. The problem is that this is not successfully accomplished. It’s true that there are buildings, it’s true that projects are carried out, that many things are done, but there are many things that aren’t done. There are art galleries for exhibiting and I think that they are accessible, but accessible to a certain point. Actually, there is perhaps only one council gallery provided for the general public that truly helps, the Rey Chico (on the Paseo de los Tristes). But the thing is the Rey Chico doesn’t even pay your publicity, you have to pay for it yourself. And if it weren’t for the guy there who works really hard and manages to make things happen… Honestly it’s not a genuine support for artists. In other words, they don’t make it easy for you. Then, as far as music and theatre are concerned there are great spaces, but how many artists don’t get the opportunity to appear in that space? So, what happens when there’s a public service that doesn’t fulfil its purpose, whose approach means it isn’t open to the people from here? The bars and the street become spaces of expression for those who have found themselves left out in the cold. 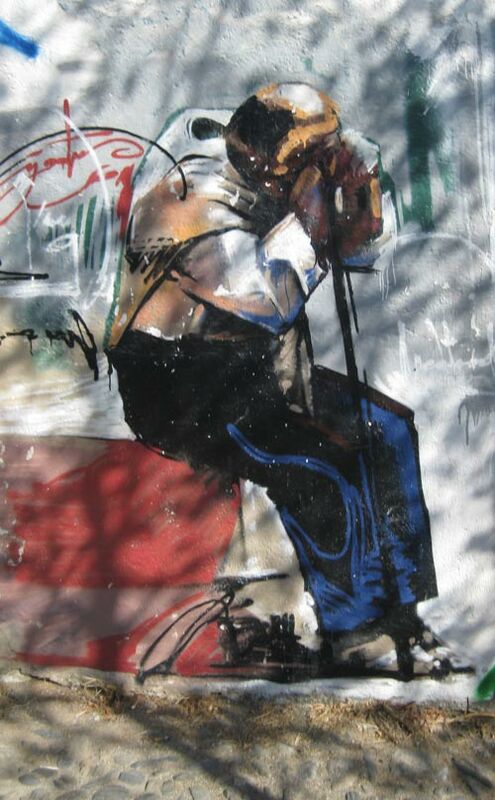 In the street we see two kinds of graffiti, one which is considered good and artistic and another, signature-based, which is considered dirt on the walls. What do you think about this? I know what I defend. I defend what I do. What I do is go to walls which are in a bad state and paint them as well as I can. I’m there giving it all I’ve got. So, in that sense I’m at peace with what I do and I take that feeling with me wherever I feel drawn to go. I defend things that I do, I’m not going to start defending things that I don’t do. What I do see clearly is that we have a mistaken understanding of things. For example, if I tell you that tomorrow the guy, or the group of people who control art here in Spain were to appear on TV and all of a sudden see the light and say: “Listen, we’ve been looking at how the state of art is here, looking at the failure of ARCO and such, and we’ve realised that art is in the street, the signatures, the tags… that’s where art is”. I bet you that everyone who’s complaining now about the signatures and all of that would rip the doors of their houses right off their hinges to sell them, they’d ask the lads to paint on the doors of their houses to sell them. And everything’s like that, that’s the truth, that’s what would happen. So, I understand that people out there are irritated and whatever, but there are other things to worry about. Even so, I understand what I’m doing now. When I was bombing and tagging I wasn’t worried about all this stuff because all I was focusing on was what I was doing. But anyway, thanks to doing that I have trained myself and I know how to do what I know how to do. That’s why I can’t disown those signatures either. What’s your opinion on the measures that the city council want to take against graffiti such as making a record of signatures? Making black lists is prohibited. Supposedly, the police can’t draw up lists of potential suspects. That was stopped after Franco. But, in one way or another, we all know that that will continue to exist, this list is just one more. In any case, they’re not going to accuse me of things that I haven’t done. And as for the things I have done, even if they do accuse me, we’ll see who’s proved right. I take responsibility for everything I’ve done. And I’ve done it because I believe in it. What marks you out from other graffiti artists? I think a possible difference lies in the aesthetics of my pieces. I have my style, my way of doing things. I have my way of doing things when it comes to where I paint and that, but then I also have my own style of painting. My graffiti is very important to me, each of us is always looking for our own style, it’s like what we were talking about before. It’s a search for that singularity, it’s a path towards the inner self to then share what we find within, that’s what’s interesting about it. So, I don’t think there’s a difference between what I do and what other people do, at root level I mean. When it comes to expressing the inner being, everyone does it in his own way. Even so, it’s also true that there are a lot of people in Granada who aren’t painting in the city because they can’t. You’ve already seen what’s happened to me on the wall just round from here (in the Calle Vistillas de los Ángeles). I had permission from the owner as well as a piece of paper that I presented to the council and look at the trouble I’ve been landed in. Now I’ve got a letter telling me that I have to whitewash the wall. There are lots of artists that could be sharing their work and are keen to but they can’t. And here in Granada there is such a high quality of graffiti that the day it escapes from the waste grounds in the towns and comes into the public arena, it’ll blow everyone’s minds. Is this city council changing what Granada was before? Well, let’s say this council is changing Granada as far as it thinks it can. But here there are a lot of things that the people of Granada like and I wouldn’t bet they’ll be able to change that, however many laws they make. We have always liked the street. We’ve liked being in the street, we’ve liked having music in the street, we’ve liked having theatre in the street, having artisans, having painting. People like it and there has been great opposition to the council’s measures in this very neighbourhood (Realejo). Let’s say you’re a musician, you like to play the guitar, aren’t you going to like playing at 3000 watts, with fantastic quality? Well of course, you’d love it! The thing is that that’s not available to you. So, what happens? Well, you are left with the street and you say: “Come on, let’s go to the street”. And it’s also a great experience because you suddenly come into contact with other like-minded people. And this is something that I believe is very important for an artist; to learn from that experience and absorb it into the depth of their being. Even if you later get up and perform on the stage, that experience of “stagelessness” is very important. Many artists have come from the street. It’s clear that many great artists have come from the street. That’s why the thing not to do is turn off that tap of art, that possibility. Quite possibly there are many people who start there and then move onto other pastures. Or even stay there, which is also excellent. The point is that it’s been shown that if we have tools and space around us to express ourselves, we are capable of doing many things; absolutely anything. What I perhaps don’t see in the theatre, I see in the street. That whole idea of “I’m doing it, you can too” is very implicit. It’s subjective but it’s there: “I come here, I pick up my guitar and if I do it you can do it too”. It’s a fantastic message; that offer of art not being limited to the privileged few, but rather being something that strengthens human beings and widens our horizons. I think that often this message is more direct in the street. Even spaces specifically geared to a particular artistic activity, and therefore generally viewed as being better, don’t manage to convey the same message. Whether or not the message is understood depends on the artist. Don’t you think that actually what the group that controls culture attempts to do a lot of the time is exactly the opposite? Not to let people have access to culture, to keep the artist above the general public? Of course, but it’s not that they don’t have access to culture. What they want is for the great majority of the population to be spectators when it comes to culture. They want to create cultural spectators. Creating a spectator is about creating a client more than anything else. You’re looking for an audience who will pay the entrance fee, but that’s not art. I think that art is a human quality. Music and painting aren’t in schools by coincidence. And their presence should be much stronger. I don’t have to be Jimmy Hendrix to go home after an average day, pick up my guitar and play a few notes. That gives me life, it gives me something that other things, however important they are seen to be in our society, can’t provide me with. That’s why I think it’s very important that we never lose that connection with the tools that we’ve been given. We can express ourselves through the spoken and written word, but music or painting are methods of expression that penetrate to other areas of the self. It’s not the same. That’s why art is so crucial in allowing us to explore our inner self, to share it, communicate with others and all of that. I believe it’s something that has to form a key part of our growth. It’s a mistake to try to create an elite of artists separate from the general mass of consumers. It’s misleading and pointless. The only thing it accomplishes is “fattening the wallet” but it’s not much use to us as human beings. What we need is for there to be a whole load of stuff going on so that new things are constantly being discovered which allow us to evolve in one way or another. If we go about eradicating the possibilities each one of us has, our time on this earth gradually grows shorter. Forget climate change. The day that we all think the same and do the same, we’ll all be dead, with or without climate change. What pieces of graffiti do you recommend in Granada? There are some stairs in the Albaicín that I’m crazy about. Near to the city wall, following the Carretera de Murcia, before you get to the Mirador de San Nicolás, there are some stairs leading down to the Albaicín. They’re beautiful. Despite all the fuss there’s been in the Albaicín about graffiti and everything, those stairs have never been mentioned. I think they’re spectacular. They’ve been painted by tonnes of artists, some on the walls, some on the steps, there’s even a painting on the facades which can be seen from far away. It’s a good piece of work. Then, in the area of Callejón de Pretorio, next to the Colegio de Escolapios… San Isidoro is good too, Calle Yerma as well, even though it’s a little run-down. In Realejo there are also quite a few places that are fantastic. There are places in Granada that still have some graffiti going on but the key issue is to be able to keep this up. If we can’t continue painting, what’s there now will disappear because that’s the nature of the street. Here graffiti is something that people really value, why can’t we do it? In actual fact, everyone’s left here now, there’s no-one left here anymore. Do you think that Granada is losing artists? Absolutely, it’s been going on for a while. For instance, we’ve painted the emblematic Plaza de la Libertad many times, with international artists coming to join in without there even being an event on. It was pure nature, mates and the street. We would find ourselves painting with an internationally sought-after artist, and there was our piece finished. We can’t paint there anymore. And it was an amazing exhibition site. We used to change it every now and again. It’s a little surprising how differently the occupation of space can be viewed. The city is completely taken over in Semana Santa (Easter Week) and yet the council won’t allow small groups of friends to meet. The thing is, they base their decision to allow the whole Semana Santa deal on certain things. They say “there are lots of people who like it here, then there are lots of people who come from outside and they like it too”. In other words it’s a money-maker, it’s traditional, it’s artistic: it has its music, its smells, all kinds of things. But then there are also many other artistic expressions that fulfil these requirements perfectly. The problem is, in some way they haven’t been presented or received as they should, from an objective point of view. If there’s a large group of people here with a passion that’s artistic, with its smells, its colours…and which attracts people both from here and outside, it fulfils the same functions as Semana Santa. But they don’t understand that. Something doesn’t add up, I think there’s something going on that I can’t understand because I don’t have all the facts. There’s got to be something going on, some kind of attitude blocking these things. I don’t have any problem with Semana Santa, I get that people like it and it doesn’t bother me. But only as long as my mate Luis can strum out a few tunes in the entrance to the bar without anyone bothering us. We all have to have our own things that we like.